I've just bought myself a SKK for goat control. It's got a muzzle brake on it, and man is it loud! Originally I was thinking I'd remove the brake and just use a thread protector. I've never been keen on a suppressor as my useage is short(ish) range pest control, and I thought I didn't want the hassle of the extra length. After firing off a few (30rd) mags with this rifle I'm now thinking a suppressor might not be such a bad idea. I'm only a few kms away from a beach settlement and maybe a bit less noise might be a good thing. So my question is, how much quieter is the rifle likely to be with the brake removed, and is it worth going down the suppressor track given the pest control useage? The obvious answer is to try it and see, but unfortunately the MB is locked into place and I can't get it off, it needs to go to a gunsmith. If it proved too difficult to remove I was going to suggest just shortening the barrel slightly (which would help in the bush), but if I later want to get a suppressor then cutting off an already threaded barrel would be a really really dumb move. Any advice welcome! removing the muzzle brake wouldn't reduce overall noise but it would be a lot nicer for the user as all the noise will go anywhere other than directed back towards the user. Suppressors are good and I would suggest getting one. Bonus for shooting at mobs of animals as it can distort where the shooter is, plus saves the hearing. +1 for a suppressor. you'll be glad of it in the end. Yep, very much like that! Although I am contemplating putting a choate dragonuv stock on it and trying to keep the original stock in good condition. You think the extra length of the suppressor will not be more hassle than it's worth for pest control? I put a choate dragunov stock on my SKS. Much nicer.The pistol grip is much more natural and easy on the right hand. I love short rifles myself, so I understand your reluctance to change the length of it. 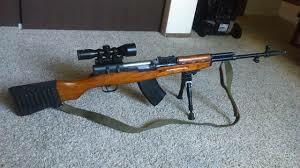 It may be possible to get a gunsmith to take off the muzzle brake, remove the front sight and bayonet mount, and fit an over barrel suppressor. This might add 6 inches to the overall length of the rifle. Whether it's reasonably doable in terms of hassle and cost, I don't know. You'd have to talk to a gunsmith. To start with removing the muzzle brake and screwing a thread protector on might not be a bad idea. I try to do the simple stuff first and see whether it makes a difference, then do something more complicated if it doesnt. if you get an over barrel suppressor it will only be about 150mm longer and the noise reduction will help your hearing and confuse mobs of pests allowing more time to shoot them. Interesting question. Hard to say either way, there are pros and cons to suppressors and to brakes, and to bare muzzles. But I agree, don't touch that hacksaw! I'd consider leave the muzzle brake on and use with electronic ear muffs. You'd be advised to use the muffs with a suppressor too, unless using subsonics. For multiple kills, what is most important are quick accurate follow-up shots. Consider that being under fire from a rifle induces confusion and panic on living targets, whether suppressed or not as it is not at all apparent where the shots emanate from. This ALSO applies to non-suppressed rifle fire. If fired at with a rifle from any significant distance you will mainly hear the supersonic crack over, or somewhere near you. After that, you may hear the (quieter) report of the gun if it is non-suppressed and this report can be used to get a bearing on the shooter -- if you are a cool customer. But imagine the panic you'd be in! The muzzle brake assists quick follow-up shots, and actually DOES give also you some advantage in making you harder to locate by the goats, even though that advantage is more ultimate with a suppressor than with a brake. Consider that the brake directs the greater part of muzzle blast noise sideways, and by the time this noise hits the mob of goats it is less easy to pinpoint where it comes from as it echoes off other things to your left and right. In other words, the bothersome extra noise in your face that you get from shooting with a muzzle brake on actually is also an advantage. A muzzle brake does make it louder , without it is quieter but the cumulative effect of firing , even without the brake , many rounds will still send you deaf and you don't get your hearing back . And hearing aids are f$^*k%#g expensive . Any suppressor will need to be made of steel etc because of rapid fire . I use a Waitaki which only adds 135mm and tames the bark , as for handling I don't even notice it there . And adding lenght is not an issue as I can it muzzle down over my shoulder , and the best stock to get for any SKS is the Choate it just works with the adjustable stock spacers . Depends on the over barrel, so would pay to check or use Muzzle foward. Waitaki engineering do a Sks suppressor but its heavyish compared to the likes of DPT, ASE or Hardy. Thats the limitation with that idea. Looks to me that it would be doable, but I have been wrong on occasion. Material would matter more than weight. Stainless vs aluminum. Rolling with a suppressor rarely has more downsides than upsides. Fun fact: back in the day before the buyback a bunch of SKKs got imported in to Australia before people started figuring out they could convert them to fully automatic extremely easily. Imporation was quicky banned but safe to say not many of them got turned in during the buyback. norinco ak, waitaki supressor on quietish, supressor off as loud as hell also the rocket exhaust effect with the ammo at dusk is tamed down. Get a supressor, ears everywhere will thank you.